Contrary to expectations, semi-final places for Huang Yu-Chiao and Lin Chai-Hui alongside Cheng Hsien-Tu and Liu Hsing-Yin emerged the end result in the opening rounds of the Women’s Doubles event on Friday 3rd November at the 2017 ITTF Challenge Belgium Open in De Haan; the morning belonged to Chinese Taipei. The greater surprise being the appearance of Huang Yu-Chiao and Lin Chai-Hui; they were not seeded, commencing matters in the qualification tournament. In the opening round they accounted for the combination of Romania’s Adina Diaconu and Russia’s Yana Noskova, the no.5 seeds (11-7, 11-5, 11-8) prior to ending the hopes of the partnership formed by Luxembourg’s Sarah de Nutte and Germany’s Wan Yuan, the no.3 seeds (11-6, 11-2, 11-13, 12-10). Impressive from Huang Yu-Chiao and Lin Chai-Hui, it was the same from Cheng Hsien-Tu and Liu Hsing-Yin; the no.6 seeds, in the opening round they beat Turkey’s Sibel Altinkaya who partnered Bulgaria’s Anelia Karova (11-8, 8-11, 11-3, 11-5), prior to recording a quarter-final success in opposition to India’s Manika Batra and Mouma Das, the no.2 seeds and quarter-finalists earlier this year at the Liebherr 2017 World Championships (11-6, 5-11, 11-9, 12-10). Surprise semi-finalists and there was one more pair who reached the penultimate round contrary to expectations. 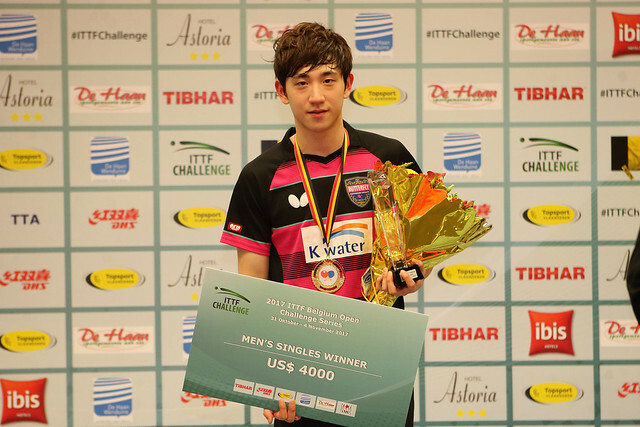 Korea’s Lee Zion and Song Maeum, like Huang Yu-Chiao and Lin Chai-Hui having been required to compete in the qualification tournament, overcame Marharyta Baltushite and Daria Trigolos of Belarus, the no.7 seeds (11-7, 11-7, 8-11, 11-6) in the opening round, prior to recording quarter-final success in opposition to Russia’s Maria Malanina and Polina Mikhailova, the no,4 seeds (11-7, 6-11, 11-7, 11-9). Unexpected semi-finalists but not involving the top seeds; Japan’s Honoka Hashimoto and Hitomi Sato advanced in style. In the first round they beat Katsiaryna Baravok of Belarus and Poland’s Magdalena Sikorska (11-1, 11-3, 11-5), before at the quarter-final stage accounting for the host nation’s Margo Degraef and Lisa Lung, the no.8 seeds (11-6, 11-4, 11-9). At the semi-final stage Honoka Hashimoto and Hitomi Sato meet Huang Yu-Chiao and Lin Chai-Hui; in the opposite half of the draw from Cheng Hsien-Tu and Liu Hsing-Yin; confront Lee Zion and Song Maeum.